Healing as a Resto Druid in Mythic+ is somewhat similar as healing a raid except you have to take on the bulk of the spot healing yourself and the damage patterns are often burstier. You’ll need to run each dungeon a few times to get a good feeling for the damage patterns since, like raid, pre-hotting is incredibly important. Make sure you’ve read through the essentials chapters of the Resto Druid guide before you get started here since a basic grasp of your abilities is assumed. Full Mythic+ Guides including routes, boss tips and useful Weak Auras. A deep dive on the first talent row (Cenarion Ward, Prosperity and Abundance). Catweaving in Mythic+: How to contribute DPS effectively as a Resto Druid. Remember: You can contribute much more to a dungeon than just healing. Don’t forget about your powerful damage and utility. Mastery is our best Mythic+ healing stat due to the high average number of HoTs we can have on allies at any one time. Haste is second best since it helps us respond to the burst damage common in dungeons and because we can drink between packs we’re able to chain cast spells without issue. It also increases our DPS so it’s a great allrounder. Crit and Versatility are further behind but are still very useful – particularly while DPS’ing. Take Feral Affinity if you want to contribute meaningful DPS (recommended), and Guardian Affinity if you’re brand new to the spec. 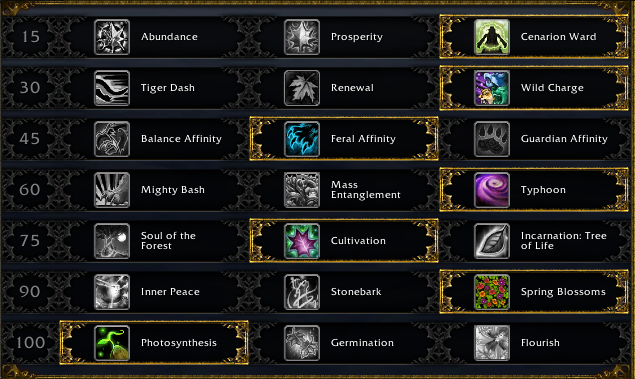 You can read more on the first row of talents here including more information on the prosperity pitfall. Tiger Dash is a reasonable choice over Wild Charge, especially for indoor dungeons. 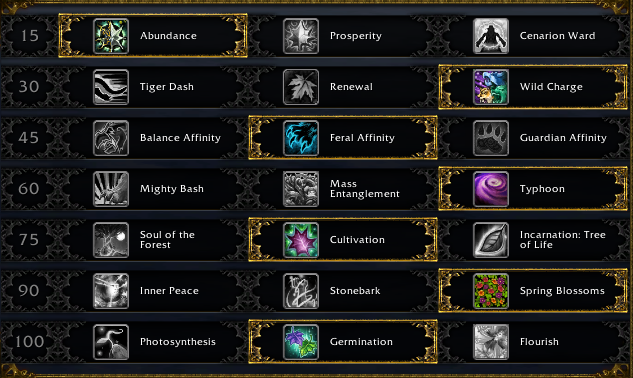 You can swap between Cenarion Ward and Abundance depending on the AoE healing requirements of the dungeon or affixes. Consider Abundance for Bursting, Grievous and Temple of Sethraliss in particular. Consider swapping to the Specialized Debuff Healing build in Kings Rest since it Germination offers more against Spit Gold / Severing Axe. The standard build still does ok here too so if you prefer the playstyle then there’s no hard requirement to switch. Resto pairs strong healing with powerful utility and to not make full use of it is to waste half your kit. Ursol’s Vortex: Use it to kite mobs, or with Typhoon to tightly pack mobs together. Soothe: Removes enrage effects from mobs. There’s something to Soothe in almost every dungeon. Typhoon: Use it to knock mobs out of Sanguine, interrupt most casters, or buy your tank some breathing room. Many mobs can be interrupted this way. Entangling Roots: Use it to CC a melee mob in large packs like in Halls of Valor. Growl: Use it with Bear Form to tank a boss for a couple of hits to let the tank drop Necrotic stacks. Bear Form: Use it to survive almost anything. Consider reading through the Azerite page for a full rundown on the best Azerite traits in a dungeon environment. Great Mythic+ Trinkets: Aim for an on-use trinket in one slot minimum (Mirror of Entwined Fate, Ward of Envelopment, Ignition Mage’s Fuse). Consider reading through the Trinket page for a full rundown on the best Trinkets in a dungeon environment. Including most general pulls without notably dangerous mobs. Keep Lifebloom and a rejuv on the tank. Put Efflorescence down. Try and cover as many people as you can but you must hit the tank with it. Use Regrowth and Wild Growth to keep people healthy. Let your HoTs do most of the work. If they’re sitting on 80% health in Efflo then they’re fine. Including moderate tank and party damage. Examples: A bad pug group on Volcanic, Vol’kaal, a tougher trash pull. Put Efflorescence down. As above, make sure you hit the tank and as many party members as possible. Keep Rejuvenation on anyone you expect to take damage. This might include anyone with a DoT on them, or the entire party if you’re staring down a Cragmaw Tantrum. You really can’t be casting these reactively. You need to practice preempting damage so that HoTs are already rolling when it hits. Cast Wild Growth as the damage hits. Use Regrowth as your filler spell. With 2-3 HoTs on each target it’ll put out very high, very fast healing. Use Swiftmend to cover anyone who dips sharply. You expect everyone to be near-death very soon. Often the tank becomes your lowest priority during heavy damage since they have better survivability cooldowns than anyone. It still doesn’t hurt to throw them a rejuv but if you’re short on global cooldowns then use your own judgement. Swap Lifebloom to yourself. Think of this decision as increasing your AoE healing by ~15% while reducing your tank healing by 20%. In times of heavy AoE damage that’s a worthwhile change. Cast Rejuvenation on anyone that’s going to be hit before the damage hits. This is quite a few global cooldowns so prepare early. Use Regrowth and Swiftmend on the lowest HP party member to try to stablilize. Ask your DPS to pop personal defensive cooldowns. These can make a huge difference and are often under-utilized. Use Tranquility if necessary and reapply Rejuvenation in between your Regrowth casts. Remember: You can, and should, drink between packs to keep your mana bar healthy. We are well placed to deal with Grievous; however, it eats up quite a lot of our global cooldowns so expect your DPS contribution to take a hit. You really need to focus on prevention rather than trying to recover from 4 stacks on the entire party. Deal with Grievous stacks as they appear and use your big healing cooldowns regularly. You can’t always rely on one rejuv to bring your target back above 90%. Be proactive. Keep Rejuv up on anyone you expect to take damage (and thus Grievous) in the next 15 seconds. Cast Wild Growth if more than 2-3 targets have Grievous. Use Regrowth (with Abundance) to heal each target to above 90% health. Don’t worry. It happens to all of us. Get as much Rejuv coverage on the party as possible. Regrowth anyone who’s still a little low. Ask the entire party to pop defensives while you stabilize. We have some great cooldowns to deal with high stacks, but if you’re going over 6-7 stacks every pack then you’re eventually going to falter. The worst case scenario is 5-8 mobs dying within 4 seconds of one another since Bursting stacks refresh when a new mob dies which means you’ll have to heal through 5 stacks, then 6, 7, 8 without any real chance to recover. We blame the DPS when this happens. Rejuv your party when the first mob in the pack hits ~40-50% health. Drop Efflorescence. Make sure you catch at least three people in it. Cast Wild Growth as the damage starts rolling in, and fill your other global cooldowns with Regrowth. Cast Tranquility if it’s a big stack. If you’re in voice with your party then ask them to pop defensives and health stones. You can recognise if a regrowth isn’t going to reach them in time and take charge. Every spec in the game has a defensive of some kind. You can Soothe off the Raging debuff and you should do so regularly. Expect heavy tank damage during Raging week, particularly in pug groups where several mobs might be DPS’d low at the same time.